Beauty salons, Spa's, medical clinics, lawyers, teachers. 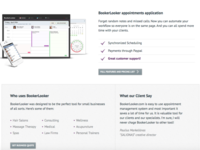 An appointment management software for businesses of all sorts. 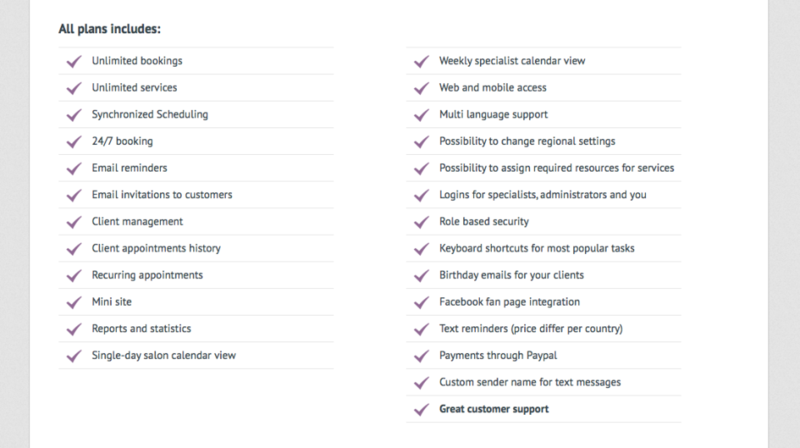 Easy to use customer appointments, online booking and text reminders. This is a system that provides many possibilities to choose services of beauty salons and other companies, that makes easier processes of rezervation, organization of visits, storage of data base and appointment history of Your clients. Comments: Found bookerlooker on the internet, also tried other 3 softwares, but bookerlooker was the most attractive software for me. 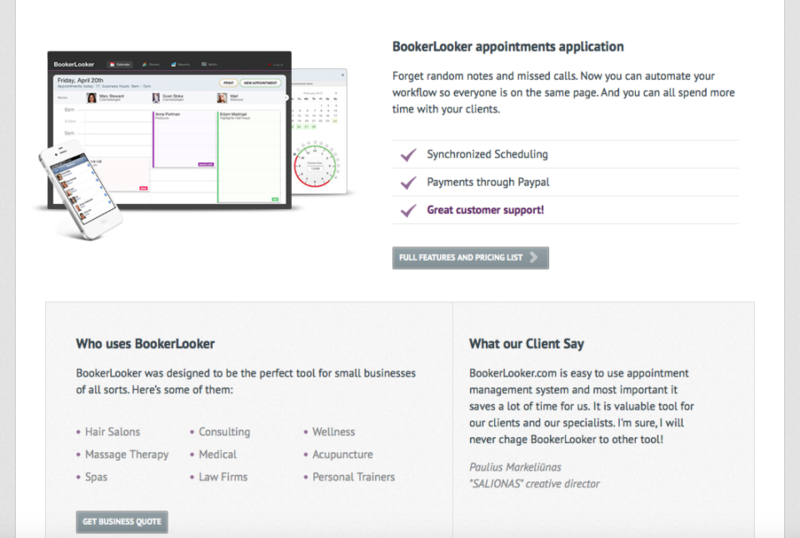 I started to use boookerlooker and noticed better situation with no show ups of the clients, as they are used to get reminders now , so less no show ups. Easy and efficient tool. Comments: It is a great software. I love customer service, all problems solved fast. Much simpler from other software I have tried. Customers just love ability to book online. Helped my buiness a lot! Comments: I used some free softwares before bookerlooer, but they never worked. Then I found bookerlooker. This software has many great feature that helps in my business. I am using it for couple of years now. It has great and fast support. But the most importsnt thing is that now clients can easily book when it is convenience for them and they get reminders, so less no show ups. Another feature that I like that each worker has his own login and he can set up his working hours and to see all his appoitments. Overall: Great software, all info about cleints in one place. Helps to track all employees , what appointements they have, if they have cancelled appoiments. Text reminders helps clients not to miss appointments. Comments: I like this software, there I can see a monthly overturn, workers receive an emails or sms about new appointment. Customers can easily book online and receive an emails and sms reminders. 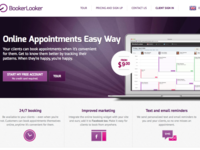 Comments: BookerLooker.com is easy to use appointment management system and most important it saves a lot of time for us. It is valuable tool for our clients and our specialists. I'm sure, I will never chage BookerLooker to other tool! 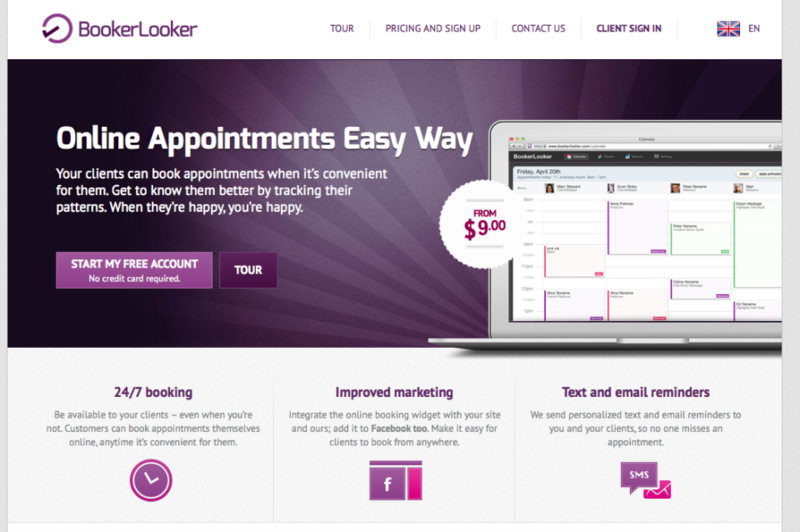 Comments: We needed very complex booking system but could adapt Bookerlooker to our needs. 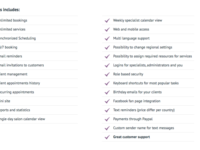 Most requests are answered within one day so we are pleased with the service. Comments: Great software, helps to organize information about clients. Easy to use, fast support. Clients love sms reminders and that they can book online for services. Comments: Great for work organization and very comfortable for the clients.